In one sense, engagement is the human connection between customer and business. However, you can’t determine whether your Facebook marketing efforts are giving you the expected return based solely on how connected they make you feel — and this is why you measure engagement. 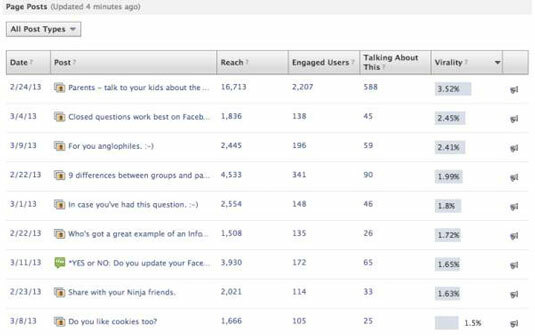 Page mentions in status updates, replies within comment threads, and the general sentiment expressed in the actions Facebook users take around your Page can be measured with the Insights analytics tool included with every Facebook Page. Facebook Insights allows you to see how each post has performed. Liking, sharing, or commenting on a Page story: You can view more details about Likes and comments by clicking any data point in the Talking About This column. Playing a video or viewing a photo: You can view more details about video plays, photo views, and more by clicking a data point in the Engaged Users column. RSVPing to an event associated with your Page. Tagging your Page in an update (otherwise known as mentions): You can view mentions by clicking any value in the Talking About This column. The bullet list below includes four Facebook Insights reports that show how engaged Facebook users are with your content. Make a habit of regularly viewing these four reports on your Page. To access these reports, first go to your Facebook Admin Panel and then click See All next to Insights. When you do this, you can access any of the following four reports. The Talking About This graph: Click the Talking About This tab, scroll down to the How People Are Talking About Your Page section, and then select Stories from Your Posts from the drop-down menu. The resulting Talking About This graph shows how many Facebook users have either liked, commented on, or shared your Page update over a specific amount of time, which you can select at the top. Each dot within the graph shows you how many individuals were talking about your updates in the span of a week. The Viral Reach graph: The graph on the right shows you viral reach, which is the number of people who saw the actions displayed in the graph on the left. Pay attention to the spikes in this graph and investigate the content that you posted during these peak times. The Page Overview report: Click the Insights icon again, and you’re taken to a graph showing how updates to your Page are followed by increases in engagement and awareness. The purple dots on the bottom of this graph indicate how many times you posted updates on a particular day (larger dots indicate higher daily frequency). The green (middle) line shows how many people talked about your content, and the top (blue) line shows how many people saw content related to your Page. With this graph, you can see the way your Page updates cause people to respond (liking, commenting, sharing), and how their engagement is seen by their friends. This graph essentially depicts the effects of your content and engagement. The Page Posts report: Scroll down below the Page Overview graph to see a report listing your most recent Page updates and some statistics about how those updates have performed. In this Page Posts report are several columns, including information such as the date you posted the update, an excerpt from the update, how many users engaged with that update, and how many people were talking about that update. The right-most column is Virality, which shows the percentage of people who saw your update that talked about it. If you rank this list by Virality, you can quickly determine which updates were talked about the most, and from this information, you can start to define trends about the content on your Page that people reacted to the most. Because real engagement with fans grows over long periods of time, choose weeks or months for your ranges of data in Insights. In other words, don’t bother tracking this information on a daily basis. Facebook uses the EdgeRank algorithm, which determines whether fans will see your content in their News Feeds. One of the biggest factors in this algorithm is the prevalence of comments and Likes each of your Page stories receives. 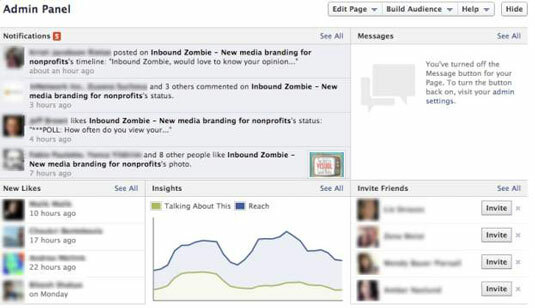 Facebook Insights shows you how you can post updates that receive more Likes and comments.